After doing a series of complex and quite, in Robs words “ethereal”, posts about the nature of history, Constantine and philosophy I thought I would do a light hearted look at Barbarians and Romans. We have been looking at pictures of Trajans Column for a few weeks now and I feel the need to share with you a simple rule that might help you distinguish civilized Romans from everyone else. So the first rule is that the Barbarians have not bothered to shave before the big battle whilst the Romans have got up nice and early, had a shower, shave and breakfast before making a decent effort on the battlefield. So the important thing to note is that “B” is for Beards and “B” is for Barbarian. So this is a general rule that should help you if you need to work out if the person in front of you is a barbarian or a proper person. Next have a look at this battle field. In this picture are Barbarians fighting auxiliary Auxiliary are barbarians who are recruited into the army and will gained citizenship on successful completion of service. One of them has a Dacian head in his mouth. So here we can see that all the barbarians are wearing trousers so that gives us a hint of another rule to help us. Quickly compare this with the image below and you note that the Emperor is wearing a tunica. In the picture below you can see a group of Roman legionaries, bona fide Roman Citizens and they too are wearing tunicas. Now the latin word for trousers is braccae and here we see it again. “B” is for barbarian “B” is for braccae. Its a fundamental law. THESE ROMAN LEGIONARIES ARE MAKING A ROAD. ONE SOLDIER SWINGS A PICK-AXE (A DOLABRA), ANOTHER MOVES EARTH IN A WICKER BASKET. THE ROMANS DID NOT USE WHEELBARROWS! THEY WORK IN THEIR ARMOUR, WITH HELMETS AND SHIELDS NEARBY IN CASE OF SURPRISE ATTACK. TWO CHOPPED OFF HEADS HAVE BEEN SET UP AS A WARNING! Surely a mistake in the colour coding here. 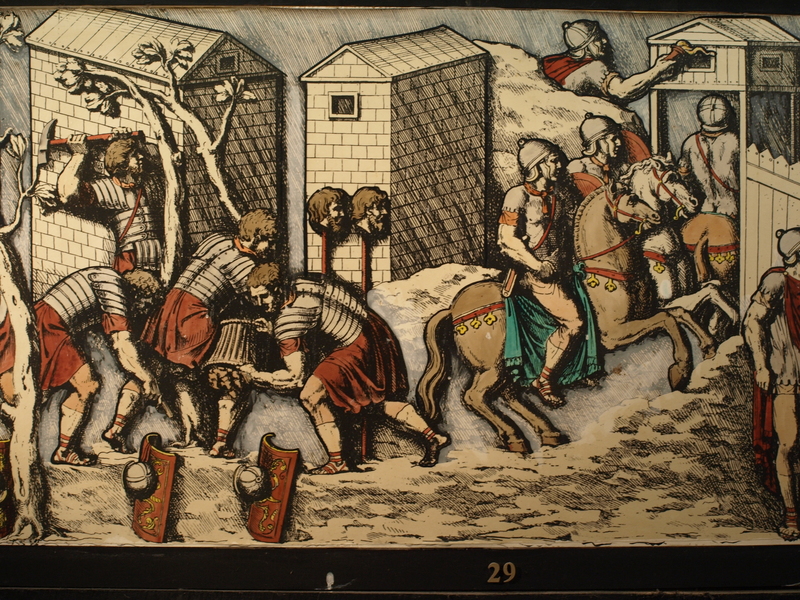 The severed heads, by their context, have to be Dacian – and should have RED hair. Should we associate these images with a head-hunting cult as suggested in previous posts? I doubt it in this case. The troops here are legionaries, which means they are all bona fide Roman citizens – and there is a purpose to this grisly display. It says “Men at Work.. Do Not Disturb”. But if they are disturbed they are ready for you. Note the close proximity of helmets and shields. Here we see construction work in an active warzone being undertaken while wearing body armour. I have done jobs in the construction industry involving hard manual labour. I also wear Roman body armour on a regular basis as part of my job at the Lunt. I would hate to have to combine the two! Simply moving about and projecting the voice for two hours , while wearing this stuff, is an exhausting experience. Of course, I am a modern softie – not of the hardy peasant stock these men were. Yet even for them, this work, especially in high temperatures, must have been punishing. As we learned recently at the Fort, their stamina and endurance are held in awe by the toughest soldiers in the British Army of today…. Manumission from barbarian into citizen was the social innovation of Rome. The Greeks moved the other way from being tolerant of barbarians to mistrust of the otherness. Carthage similarly produced a two tier society of elite and plebs with no possible movement between the two. During Hannibal’s rampage around Italy states allied to Rome remained largely loyal because they were bound to Rome by the privilage of citizenship, in contrast the Carthaginian states were vulnerable to defection and treason because they did not share in the good fortunes of their imperial masters. I agree with Rob that it was probably out of reach for anyone outside of Italy but in Italy it was of incredible value to the Roman state. The Romans were quite right to be wary of extending citizenship, particularly to the Gauls and their kindred, citizenship was a line demarcation in the sand , which in the eyes of the ancients, divided the animal from the human. In law you could do awful things to barbarians and nobody would bat an eyelid, they could be taxed, their legal position was uncertain and the punishments were abominable. In contrast the citizen could join the army, was exempt from certain taxes and enjoyed a privileged position in law. St Paul is the prime example of citizen enforcing his rights. We often wonder how the Romans could put people to death in the arena in hideous ways, we forget that these people were not citizens and so we not, in Roman eyes, people. It is in our Human Rights era an absolute paradigm shift, now a foreign terrorist has the same rights as a British citizen an impossible situation in ancient Rome where a barbarian might be seen as on the same legal level as a pedestrian in Grand Theft Auto. I suspect that Caesars actions in Gaul were criticized because he citizenised unreconstructed Gauls as a political move rather than a true manumission. By doing so he might have been perceived to devalue the system and devalue the status of the citizen. Something that he certainly did as Dictator when he ushered in the age of Empire. With regards to the sausage clearly it is a ubiquitous foodstuff but the point is that it was associated with the Germans and in an unstable age the Emperor wanted the reset the empire to a Roman pattern and expel non-classical influences. Which begs the question why did he allow Christianity? 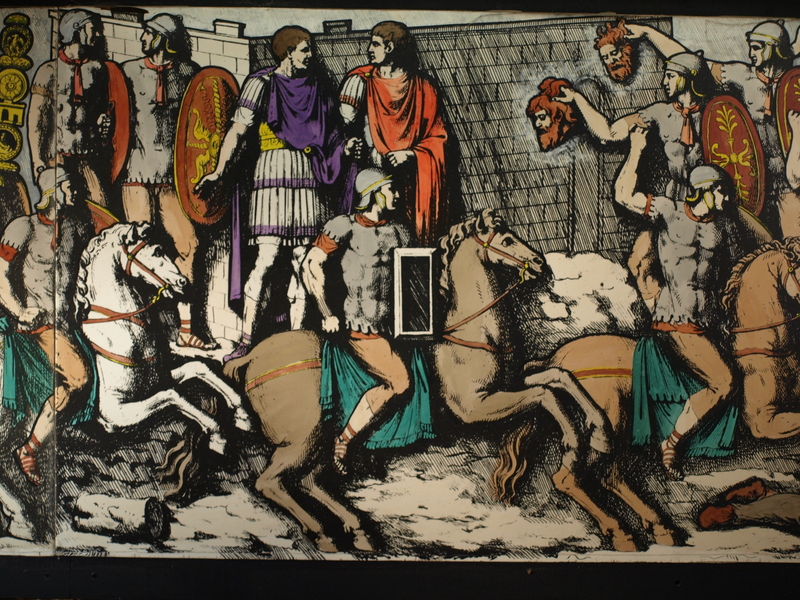 At the Fort we have a wonderful frieze (over 100 feet long) showing a colourised version of part of Trajan’s Column inRome. Here’s another scene from it. THE EMPEROR (IN PURPLE) DISCUSSES HIS PLANS WITH ONE OF HIS GENERALS (IN RED). HORSEMEN GALLOP PAST TOWARDS THE BATTLE. 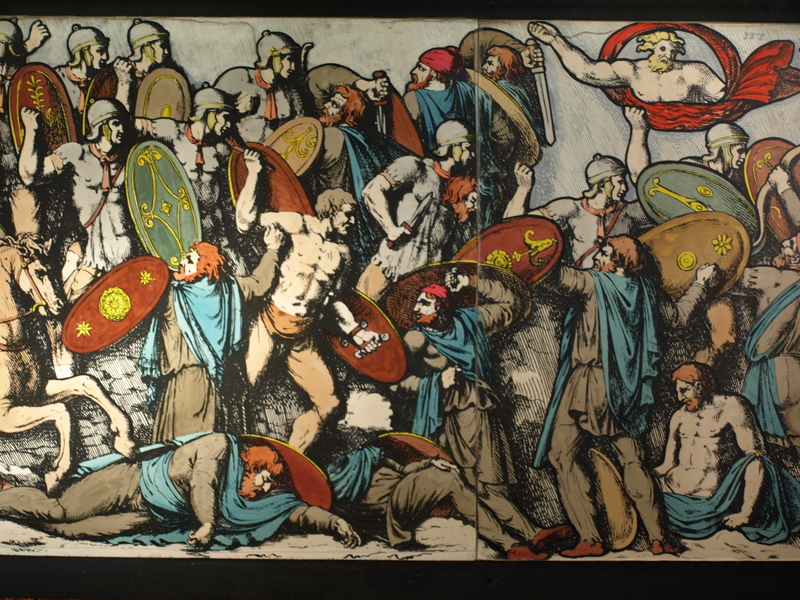 ROMAN SOLDIERS RUN BACK TO SHOW TRAJAN THE DACIAN HEADS THEY HAVE CHOPPED OFF. All the Roman soldiers shown here are auxiliaries (infantry and cavalry). The interesting point to note is the extreme shortness of their tunicas and mail shirts. As someone only too used to wearing the mail “lorica hamata” I feel well qualified to make a few comments on this. None of the mail shirts worn by auxiliaries on the column show shoulder- doubling. This doubling can be clearly seen on the image of yours truly depicting a member of the Fort garrison. The extra thickness of mail on the shoulders was a vital protection against attack by slashing weapons. It was copied from the Gauls in the time of Caesar and rapidly adopted by the late Republican legions. It is surprising to find its absence on the Column, depicting events around 100 AD. Facing up to the murderous Dacian falx would make shoulder -doubling very very important. The other odd thing here is that extreme shortness I mentioned a few lines ago. The cavalrymen would indeed have worn a short hamata, as it was necessary for them, as riders, to have freedom from the hips down. The same does not apply to the infantry. 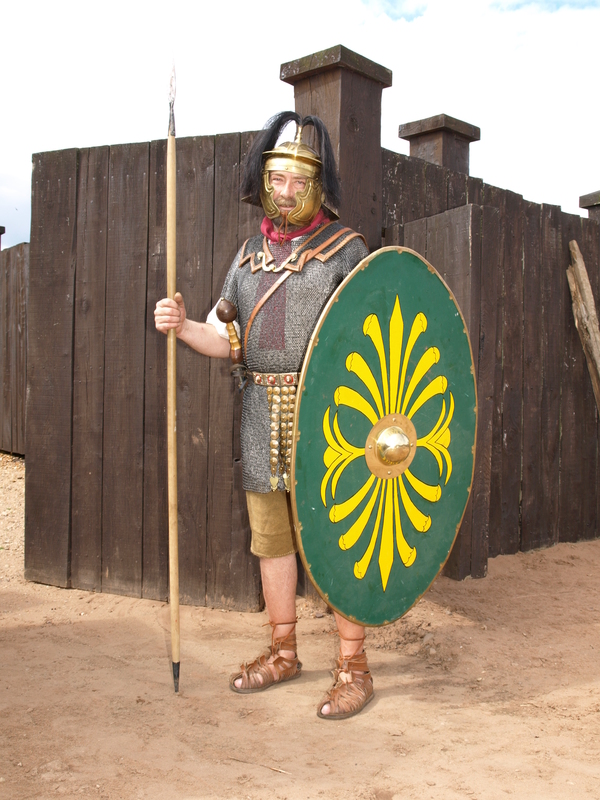 The more protection the better – and one of the great advantages of the flexible mail shirt is that it gives good protection to the rather vital area of the crotch, which a “lorica segmentata” (as worn by legionaries) leaves wide open. My mail shirt ends halfway down the thigh, completely covering groin and rump. You feel safe in it. It definitely leaves me wondering whether the designers and sculptors of the Column had ever actually seen a soldier in a mail shirt. If the men were not wearing their “femenalia” – the tight (eye-wateringly tight it appears) knee breeches – the Column would be a spectacle of mass indecency. Poll to settle discussion point – without having to resort to a knife fight!!! Listen to the arguements and then you decide. The Lunt staff are intelligentsia in their own lunch breaks and often pretend to have ideas of their own! No seriously we all are keen historians who love debating and discussing history. Rob and I disagreed about the importance Britain to the Romans and need your help! Please vote to tell us what you think. I don’t think the Romans needed Britain at all. I think that in the long-term The Empire probably made a net loss from Britain in financial terms. It was a perennial drain on the resources of the Army. Two or three legions had to be permanently stationed here, massive defensive works had to be built and maintained, an expensive Fleet had to patrol the Channel…… the list goes on. Its true that Britain held useful mineral resources – lead, silver, copper, iron, even a little gold – but these needed huge investment in the necessary mining infrastructure. In agriculture the Romans laboured mightily to improve output to a level where, for brief periods, Britain was an exporter of grain – mainly used to help feed the Legions on the Rhine. Transport costs were always high, however efficiently agriculture was organised. Well I disagree. Britain was important to the Romans and afforded significant advantages. It may have made a net loss financially but strategically it was worth all the money they wasted on it. This is demonstrated by their investment, their military commitment and even the war they fought to regain the province at the end of the British Empire period. In contrast Dacia was abandoned after the death of Constantine the Great showing that the Romans were quite happy to abandon unprofitable provinces, and that Britain wasn’t one of them.The strategic importance of Britain was in the control of Northern Europe. The fleet based in Britain was essential for policing the North Sea. Without this base Angle pirates would have not been tackled at their source but would have been able to pirate about the Atlantic at will. Next the military commitment in the country was a reminder to continental powers that if they were looking at migrating across the boarder they soon would be fighting a war on too fronts. They took on the role of a fleet in being http://en.wikipedia.org/wiki/Fleet_in_being . Finally if Britain was important for ensuring that it was not a haven for terrorists and insurgents who would cause problems for the Romans on the continent as the Belgians did during Julius’ campaign. The resources of Britain needed to be in hands of the Empire so that they did not fall into the hands of their enemies. I would go to the Celtic camp the night before the last battle between Boadicea and Paulinus. I know it is morbid but at that impossible moment it seemed that the golden age of heroes had returned. A generation after the invasion and subjection of the country by the Romans things were looking poor for the celts. They were being taxed, they were paying for a temple in honour of Claudius who had conquered them and their land was being confiscated by the Romans for a veteran colony. Then the Romans broke their word to Boadicea, took her land, raped her daughters and whipped her. They sowed the whirlwind and it broke on them. The Celts rose up, united for the first time in generations to avenge the honour of a wronged queen. They had put tax collectors, administrators and other grey people to the sword then given the collaborators and quislings a robust talking to. Then they fell on the veterans destroying them and the towns of London and Colchester. Paulinus returned from Anglesey to discover his province on the verge of disaster. He decided to advance towards the rear with the celts on his tail. Days later the two sides faced each other on a lost battlefield ready to fight in the morning. The night before the celts celebrated. They drank, they boasted, they sang and dreamed that their world would change. They imagined that with the destruction of this last Roman Army they would usher in new golden age, of heroes, of honour and pride and manliness and all the things that the Romans had taken from them. Little did they imagine that their leaders were already squabbling amongst themselves, that the Romans had chosen this battlefield to end forever the freedoms of the Celts and that after the battle the Romans would engage in retributions that would put an end to celtic dreaming forever. The battle began between a 120,000 strong celtic force and 25,ooo Romans who in the course of the battle destroyed the celts leaving 80,000 dead on the field compared to 400 Roman fatalites. But that is the morning now anything could happen till the morning I would like to share those impossible dreams, that passion for honour and freedom. Till the break of dawn I would share the dreams of a vanquished people. This post is mirrored in a later post where I imagine seeing the moment when Romans won the battle against the Celts in the face of impossible odds.